A low-cost ID Scanning solution for businesses that only need to scan magnetic stripe licenses and IDs. This package comes standard with age verification software and includes a duplicate ID detector. 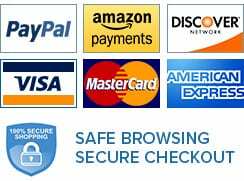 These are the only states that use Magnetic Stripe for storing ID holder data in 2018: AL, AZ, AR, CA, CO, FL, LA, MI, MN, NM, OH, TX, VT, (CAN: BC ). For more detailed state and province ID format data, please see our coverage chart. PLEASE NOTE: If you live in a state that does not offer Magnetic Stripes on your state’s IDs, consider upgrading to the IDVisor Smart for full 2D barcode reading capabilty. 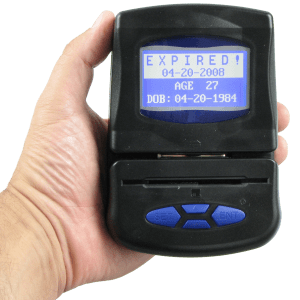 The basic model Magnetic Stripe ID Scanner includes age verification software and a duplicate ID detector. The package includes everything needed to start checking IDs. Just remove from package, install battery or plug in, turn on, set clock and starting checking IDs! Simple operation – no buttons to press. Just swipe licenses and display updates. Easy Setup – Simply unpack, turn on and start checking IDs. Stores last 3,800 ID scans in memory for download—substantiates due diligence/affirmative defense and/or build customer database. Note: scanner will delete all data once 3800 scans are recorded. Use download software to save data before scanner auto deletes data. Video/photo capture possible by using transaction date/time stamp to synchronize with venue security video system. Transaction download software and cables included. No extra software to purchase ($90 value). Scroll, search and delete license data on device—no PC required. Includes Hand strap, USB cable, Data download CD and AA batteries. Includes hardware and software to transfer compliance transaction data to a PC – $90 value (based on what the competition charges). Used to prove licenses were scanned. Note: This software can not be used to create a mailing list.